The Ancient City of Vijayanagara refers to the urban core of the imperial city and the surrounding principalities of the capital of the Vijayanagar empire during the fourteenth to sixteenth centuries C.E. Notes by foreign travelers such as Abdur Razzak, the Persian who visited Vijayanagara in 1440, mention six fortifications before the gates to the royal palace. The large area between the first and third fortifications contained agricultural fields, gardens, and residences. The notes of Robert Sewell describe countless shops and bazaars (markets) filled with people from different nationalities between this fortification and the palace. The ancient city of Vijayanagara was a marvel to behold. One of the great cities of its time in the world, the city's planners created a fortress-like city complete with hundreds of religious structures. The people of Hampi, the core of the ancient city of Vijayanagara, centered their daily life around religious devotion. The land surrounding the development provided fertile soil for farming, rich iron deposits, and natural outlying fortress sites. Those resources contributed to the creation of a highly developed civilization, protected by the military might of the empire. Why the Vijayanagara empire, possessing such military power, a vigorous economy, powerful religious traditions, and natural defensive features, fell to the Muslim sultanates after only two centuries is puzzling. The Battle of Talikota, in which the Muslim sultanates demolished the armies of Vijayanagar, may hold the key to explaining the fall. The rulers of the Vijayanagar empire, seated in Vijayanagara, had become complacent and overconfident. They had mistreated their Muslim neighbors, who finally joined a league against them. Although outnumbering the Muslim army 150,000 to 110,000, the Vijayanagar empire fell in a short, intense battle. The Muslim calvary, and younger leaders, proved superior to the Vijayanagar foot soldier based army with elderly generals. Overconfidence and arrogance may have been the reason for the downfall of the Vijayanagar empire and the sack of Vijayanagara. Recent excavations have unearthed archaeological artifacts dating from the thirrd century B.C.E. to early in the second millennium, documenting evidence from over seven hundred important sites. Those sites include ash mounds, ancient settlements, megalithic cemeteries, temples, and rock art. Those findings show that the Vijayanagar area had been densely settled for a long period before the creation of the empire. Starting at its outermost fortifications, the principality of Vijayanagar spans from Anegondi in the north to Hospet in the south and covers a total area of 650 km². (Studies conducted by Vijayanagara metropolitan survey concluded that the ancient fortified city with all its walled suburban settlements encompassed that area. Some suburbs had been as big as towns, people still populating the place.) 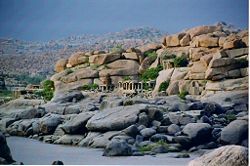 Vijayanagara's core, an area of 25 km², includes the Tungabhadra River flowing through rocky terrain with huge boulders piled in massive formations. In addition to that naturally daunting landscape, builders constructed fortifications surrounding the regal city in several layers. The rocky hillocks made excellent sentinel points for watch towers. South of the river the rocky landscape disappears, replaced by flat cultivable land. Granite boulders provided the raw material for the large and small temples complexes built there. The largest populations settled to the south of the irrigated lands watered by a system of clever ducts and anecut (dams) channeling water to the capital from the river. At its peak, Vijayanagara may have had up to a million residents. For the sake of simplicity, archaeologists divided the capital area into many zones. The Sacred Center and the Royal Center constituted the major two zones. The former, generally spread along the south bank, hosts the highest concentration of religious structures. The Royal Center has been noted for its stately structures, both civil and military. The seat of power of the empire was located at the core of that area. Islamic Quarter, also sometimes called the Moorish Quarter, sits between the northern slop of the Malyavanta hill towards and the Talarigatta Gate. According to the archaeologists, high-ranking Muslim officers of the king’s court and the military officers stayed in that area. Two important legends played an important role in making Hampi (the core area of Vijayanagar) a pilgrim destination for several centuries prior to the Vijayanagara era. One legend describes the marriage of a local Goddess, Pampa, with Virupaksha (Lord Shiva) on the Hemakuta Hill. Thereafter, devotees considered the city an incarnation of Parvati. From Pampa came the name Pampe or (in Kannada) Hampe. The second legend draws on the Hindu epic, Ramayana. Lord Rama and his brother, Lakshmana, while searching for Sita in the vicinity of the ancient capital of Kishkindha, met Hanuman on Rishyamuka Hill. Rama made a covenant with Sugreeva, the monkey king in exile, to find Sita and get rid of the evil King Vali. The presence of a temple with icons of Lord Rama, Lakshmana and Sugreeva celebrated that agreement. 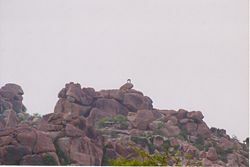 Legend says that Hanuman, the devout follower of Rama, had been born on Anjenadri Hill near the Tungabhadra river facing Hampi. Hence, he received the name Anjaneya. Archaeologists trace the history of Hampi to neolithic settlements while inscriptions confirm that in more recent times the area came under the rule of the Chalukyas, Rashtrakutas, Hoysalas, and finally the tiny kingdom of Kampili. 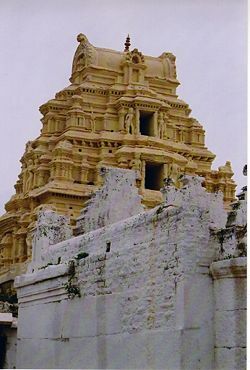 The legendary association of the area with Lord Virupaksha (Harihara and Bukka Raya associated with the Shaiva faith) and Lord Rama (the personification of the perfect king) caught the attention of the empire's founders. The natural ruggedness and inaccessibility of the area may have factored into the decision to make it the location of the capital of the new empire. At the peak of the empire, Vijayanagara had been known as one of the most beautiful cities in India. A copper plate inscription (Tamarashasana) of Marappa (one of the Sangama brothers) dates to 1346, and traces the Sangama genealogy, identifying the Sangama family deity (gotradhidaivam) as Lord Virupaksha of Hampi. Inscriptions attesting to the elevation of Lord Virupaksha to Rashtra devata ("God of the Kingdom") have been found. By the time of Bukka I, the capital had already grown into a large and powerful capital, inscriptions proclaiming, "great Nagari named Vijaya situated in Hemakuta." The Vijayanagar empire designed its cities especially to protect the empire from invaders. The city itself stood as a fortress, designed to provide maximum protection. Built of massive stone and earthen walls, hilltop fortresses and watch towers scatter across the length and breadth of the city. Visitors, irrespective of their guild and intention, had to travel through a heavily fortified and protected area before reaching the main urban core. That trek gave them an ample view of the might of the empire. Massive fortifications stood at every entry into the main metropolis, as well as crucial locations surrounding the city including watch posts and bastions located along roads, gates, and hilltops that provided maximum coverage. The capital served as the political nerve center of the empire as well as a center of commerce and pilgrimage. Envoys from kingdoms, merchants, pilgrims, soldiers, and ordinary people all traveled about in the great city on its extensive network of roads. Archaeologists have identified eighty transportation sites linked by several broad roads about 30 to 60 m wide constituted the major transport routes into the city core. Smaller roads, less than 10 m wide, led to temples, settlements, and irrigation fields. Watch towers, gates, and rest houses monitored all major roadways. Royalty, imperial officers, soldiers, agriculturists, craftsman, merchants, and laborers inhabited the greater metropolitan region. Literary sources from the era speak of large military encampments on the city's outskirts. Outside the metropolis, walled towns and villages scattered about the countryside. Some settlements may have been populated by only a few thousand people, while others had ten to fifteen thousand residents. Each settlement hosted multiple shrines and temples. Numerous Vijayanagar period relics have been lost due to the habitation of those settlements by modern day citizens. While today the city's landscape appears barren, records speak of extensive forests and extensive agriculture. That suggests that the landscape has changed dramatically. Virtually all available arable land had been irrigated using a variety of innovative methods. A significant percentage of the population worked in agriculture, making the city self-sufficient for food. That enabled it to withstand the many long sieges during the empire's three century long existence. Labors dug canals throughout the city to provide a perennial water supply to the narrow strip of fertile land bordering the Tungabhadra River. Farmers still use many of those canals today, though modified with modern technology. Many of the tanks (bunds) created for water storage purposes, like the Kamalapura tank, remain in use. Excavation of the Intensive Survey Area has shown the presence of sixty water reservoir embankments. Numerous other agricultural features such as check dams, erosion control walls and wells have been recorded. A complex agricultural industry, over a complex topography, has been revealed. That provided resources to meet the needs of a diverse population. Sandur, which formed the southern boundary of the greater metropolitan region, still yields abundant iron and haematite ores. Iron slag and other metallurgical debris have been documented at more than thirty sites. Of those, five sites have been dated to the Vijayanagar period and contain iron smelting workshops. As well as being a bustling commercial and military encampment, the metropolitan area had over one hundred and forty sacred sites, making it an important center of religion and religious pilgrimage. Along with temples, numerous sacred images and structures have been recorded in residential and defensive sites. Sacred sites include large temples with towering gopuras, such as the Mallikarjuna temple in the town of Mallappanagudi, located on the main road connecting modern Hospet and Vijayanagara and built in the period of Deva Raya I. Many smaller temples and shrines grace the site. Images of deities carved into boulder and slab surfaces, as well as hero stones (virgal) considered sacred, outnumber the temples. 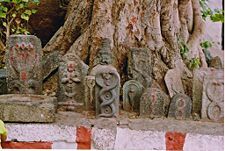 Many sculpted icons of Hanuman, Bhairava, Virabhadra and goddesses in various forms also appear as well as images from folk traditions such as naga stones (snake stones) linked with woman's ritual activities. Tombs associated with Muslim inhabitants of the city exist as well. ↑ John M. Fritz and George Michell (eds. ), New Light on Hampi, Recent Research in Vijayanagara, MARG (2001), p. 5. ↑ India, Hampi travel guide. New Delhi: Eicher Goodearth Ltd. supported by Dept. of Tourism, Govt. of India (2003), p. 63. ↑ Zones of Hampi. Retrieved May 20, 2008. ↑ John McKim Malville, "New Light on Hampi, Recent Research in Vijayanagara," edited by John M. Fritz and George Michell (MARG, 2001), p. 132. ↑ Fritz and Michell, New Light on Hampi, p. 13. ↑ Epigrapia Carnatica, V, Hn 133; Fritz and Michell, New Light on Hampi, p. 22. ↑ Fritz and Michell, New Light on Hampi, p. 104. Fritz, John M., George Michell, and Clare Arni. 2001. New Light on Hampi: Recent Research at Vijayanagara. Mumbai: Marg Publications. ISBN 9788185026534. Fritz, John M., George Michell, and M. S. Nagaraja Rao. 1984. Where Kings and Gods Meet: The Royal Centre at Vijayanagara, India. Tucson, Ariz: University of Arizona Press. ISBN 9780816509270. India. 2003. Hampi Travel Guide. New Delhi, Eicher Goodearth Ltd. supported by Dept. of Tourism, Govt. of India. ISBN 9788187780175. Michell, George, Phillip B. Wagoner, and Jayaram Poduval. 2001. Vijayanagara: Architectural Inventory of the Sacred Centre. New Delhi: Manohar. ISBN 9788173044472. Michell, George, and John M. Fritz. 1982. Hampi: Splendours of Vijayanagar Empire. Bangalore: Lavanya Publishers-Guide India for Department of Tourism, Government of Karnataka. Morrison, Kathleen D. 1992. Transforming the Agricultural Landscape: Intensification of Production at Vijayanagara, India. Thesis (Ph. D.)—University of California, Berkeley, 1992. Paes, Domingos, Fernão Nunes, and Vasundhara Filliozat. 1980. The Vijayanagar Empire: As seen by Domingos Paes and Fernao Nuniz, Two 16th Century Portugese Chroniclers. New Delhi: National Book Trust. Ritti, Shrinivas, and B.R. Gopal. 2004. Inscriptions of the Vijayanagara Rulers. New Delhi: Indian Council of Historical Research. ISBN 9788172111717. Venkataramanayya, N. 1990. Vijayanagara: Origin of the City and the Empire. New Delhi, Asian Educational Services. ISBN 9788120605459. UNESCO World Heritage Site: Group of Monuments at Hampi. History of "Ancient City of Vijayanagara"
This page was last modified on 19 March 2016, at 15:39.